A consistent, sure voice and recurring images (uncontrolled dogs, uncommunicative sisters, unhinged minds, unorthodox Thanksgivings) unite these 11 stories, which range more freely across geography than across thematic boundaries. Most are coming-of-age tales, with the exception of two of the most powerful, ""Open Season"" and the title story. In the former, reminiscent of Ellen Gilchrist's work, a 10-year-old girl and her family travel on Thanksgiving to the Maryland estate of ""the Laird,"" as her unemployed father refers to his overbearing Scottish father-in-law. 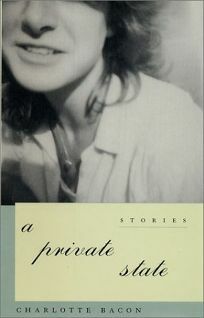 In the latter, a 14-year-old girl takes a private vow of silence when she moves to the ""very private state"" of Maine. A pregnant Bostonian goes whale-watching in the collection's best story, ""Pacific."" The whales' migration--a ""giving in to biology""--and the directionlessness of the beached whales prove instructional for the unmarried woman--and, by a kind of suggestion, for the single pregnant woman in ""Monsoon,"" another entry here. The loops of meaning coil from story to story, creating a memorable whole that transcends the sum of its parts. (Nov.) FYI: Bacon won the 1996 Associated Writing Programs Award for Short Fiction. ""Live Free or Die,"" a story in this collection, won the 1996 Pirate's Alley/Faulkner Society Award for Best Short Story.